Arrive Kathmandu. Drive up to Nagarkot 32km and 45 minutes up to 7200feet above sea-level. Deluxe resort with all rooms facing the east as Sunrise could be a spectacular experience. The resort has a swimming pool, heated Jacuzzi and quaint bar to relax in. There are mountain bikes and ponies for the more sporty kinds to explore the windy hills. The Nepalese Trio will entertain guests of the hotel and if in the mood they might teach you some steps of the local folk dance after which you have a buffet Dinner. You can ask for a Sunrise wake-up call. Rise very early to a Spectacular Experience of the sunrise setting the Himalayas on fire. After sunrise you are free to explore the countryside until breakfast time. Breakfast, proceed to Kathmandu domestic airport. Arrive Pokhara and transfer Trekotel hotel Pokhara. Lunch Afternoon at leisure. Evening spend time at the lake side exploring the local shopping of the area. 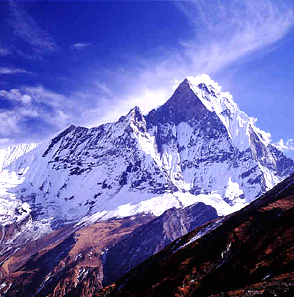 If Kathmandu is the cultural Hub of Nepal then, Pokhara is its center for adventure. Visit the Phewa Lake the 2nd largest in the Kingdom with the majestic Fishtail 'Machhapuchhre' rising behind it to create an ambience of peace & magic. The Seti Gorge . Devi's Fall - Legend has it that a trekker Devin was washed away by the Pardi Khola and mysteriously disappeared into an underground passage beneath the Fall. Mahendra Cave - This large limestone cave is locally known as “House of Bats'. See the limestone stalactites & stalagmites as well as the local winged residents. Rest of the day at leisure . Dinner and overnight at the resort. Breakfast at the hotel. Transfer to the airport for your flight to Kathmandu Arrive Kathmandu and transfer to the Hotel Ambassador. Ambassador. Afternoon at ease or do some shopping. One day Lord Shiva got tired of his glittering Palace on Mt Kailas, his armies of ghosts & spirits and even his beautiful wife Parvati. He ran away to live in the Slesmantak Forest in the Kathmandu Valley where he gained great fame as Pashupati - Lord of the animals. Pashupatinath Temple is situated 5 km east of Kathmandu. 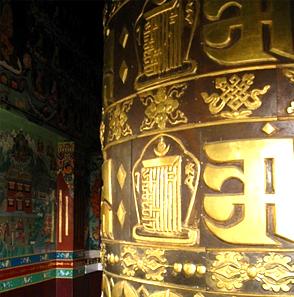 The temple with two tiered golden roof and silver doors is famous for it superb architecture. 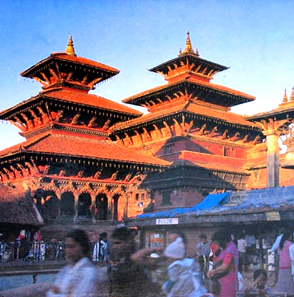 Transfer to the airport for your flight our of Nepal. * Passport or Election ID required for Travel to Nepal. * Do not carry INR 500 & 1000 notes to Nepal as they are not accepted. International departure tax in KTM INR 850.00. Air Tickets into and out of Nepal not included in the cost.